Do you have all the data but it’s siloed in various marketing tools? How do you connect, pipe, and automate data transforms to get value out of your data and why? In this interview, Peep sits down with Dan McGaw, CMO @ EffinAmazing. Dan breaks down marketing automation tools, customer data platforms, and what you can do to plan and organize your marketing tech stack and data pipeline. Dan is a seasoned veteran of growth marketing and analytics space. His expertise lies in helping businesses extract and interpret the right data to grow their revenue exponentially. He’s the founder and CMO of Effin Amazing, an analytics and marketing stack agency specialized in using data and analytics tools to increase mid- and bottom-funnel conversion rates. He’s also the CEO and Founder of utm.io, a leading tool that helps brands track their marketing campaigns with UTM links. Dan previously served as the Head of Marketing at Kissmetrics, and spent time as a mentor at 500 Startups. He works as a CMO consultant for a number of high-growth companies, implementing tools, offering support, and analyzing data. The Pe:p Show is a series of short and to the point videos. Topics that I’m covering go way past conversion stuff – it’s about optimizing all the things: your life, health, relationships, work, and business. I will also be interviewing industry peers on various topics like digital marketing, growth hacking, and more. 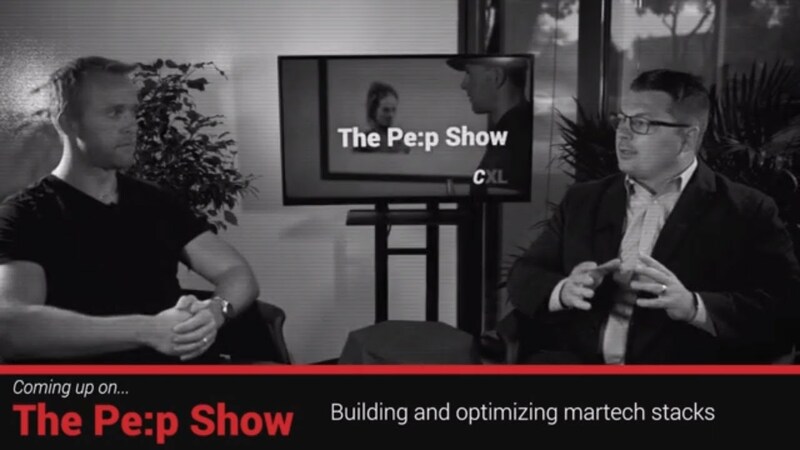 The post Understanding and Building Martech Stacks with Dan McGaw appeared first on CXL.